By Mark Patrick, Mouser Electronics. 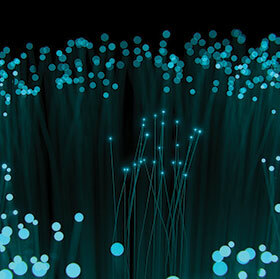 Traditional optical networking using high-performance glass fibres has typically provided what is referred to as carrier-class engineering – predominantly fulfilling high-bandwidth, high-capacity applications such as telecom and data centre networking. Additional attributes including noise immunity, galvanic isolation and elimination of electromagnetic effects also enable optical networking technology to address industrial applications – particularly in safety-critical situations or hazardous environments. On the other hand, installing optical connections using glass fibres can of course be prohibitively expensive. This has less to do with the prices of optical cables or transceivers themselves, than the time and expertise needed to properly terminate each connection. Special equipment is called for in order to cut the fibre without damaging its surface (which can otherwise cause reflections that interfere with data integrity). Moreover, since the core diameter of a typical single-mode fibre is less than 10 μm, while that of a multi-mode fibre is usually 50  62,5 μm, the optical axes of the fibre and transceiver must be aligned with a very high degree of accuracy to achieve the expected link performance. All of this makes creating optical connections an extremely specialised task that can only be performed by trained people. Historically, Ethernet communication over plastic optical fibre (POF) has achieved maximum bit rates of about 150 Mbps over distances up to 50 m, with proprietary protocols achieving about 250 Mbps. More recently, however, advancements in polymer technology have enabled superior transparency, effectively reducing the signal attenuation coefficient and ultimately allowing higher bit rates over longer distances. Effective data speeds of 1 Gbps have been demonstrated in POF-backbone applications, which could potentially scale to 10 Gbps in the future. Although this remains below the ultimate performance potential offered by glass fibre, it is more than adequate to satisfy expected home networking demands for the foreseeable future. In addition to these performance gains, POF delivers notable cost-of-ownership advantages over glass, because connections can be terminated adequately with no specialist equipment or expertise. The fibre can be cut with a sharp blade, and subsequent polishing can be accomplished quickly using a simple manual polishing fixture using ordinary abrasive followed by lapping film. Also, because POF has a larger core diameter than glass fibre (typically 960  980 μm in a 1 mm gauge cable), aligning the fibre and transmitter axes is faster and easier. As fibre has extended throughout telecom core networks, reaching closer and closer to the home, Internet service providers (ISPs) have been able to deliver increasingly elevated access speeds for consumers and small/home office (SOHO) markets. Typical fibre broadband speeds range from about 50 Mbps up to 1 Gbps. Inside the building, however, the story can be rather different, as home Wi-Fi routers often struggle to satisfy the demands of multiple simultaneously connected devices. This exposes capacity and bandwidth limitations that ultimately result in a poor user experience, particularly for services such as online gaming, streaming video or IPTV. Reverting to cabled connections could overcome the deficiencies of wireless for these types of services. Ordinary Ethernet has some disadvantages. Although cabling throughout the home is common in parts of the US or in new-build houses, it is not so widespread in Europe and can be difficult or unsightly to install retrospectively. Alternatives, such as power-line communication (PLC), are also not entirely satisfactory. Although no new wires are required, electrical noise and the behaviour of safety circuit breakers can impair data speeds and quality of service. POF can now offer an alternative to overcome the disadvantages of conventional Wi-Fi networks that are based on a single, central router. It provides a cost-effective medium for a high-speed backbone that can be installed throughout the house more easily and less obtrusively than ordinary Ethernet cable. It can coexist easily with mains cabling, unaffected by noise, and so can be passed through the same conduits to reach required locations throughout the building. By linking individual Wi-Fi access points in each room that requires a connection, an economical POF high-speed backbone can alleviate the congestion issues that challenge ordinary home or SOHO Wi-Fi networks, and ensure the full bandwidth provided at the main access point reaches all the individual rooms. The typical RF signal-power requirement for each access point is also lower than for a central access point covering the entire property. Taking advantage of the easy cutting, fibre preparation and alignment when connecting cables and transceivers, a general contractor or even a careful homeowner should be capable of installing the backbone with little difficulty. In addition, POF is establishing a presence in automotive networking, not only for linking infotainment systems, but also for connecting the diverse multimedia devices that make up advanced driver assistance system (ADAS) infrastructure and autonomous driving systems at the higher levels of the SAE scale. These include cameras, LiDAR, ultrasonic sensors, navigation systems and suchlike. POFs low weight levels and ability to handle tight bend radii are important attributes for in-car deployment. Moreover, easy and fast installation, with minimal dependence on precision alignment, helps simplify module construction, ease final vehicle assembly, and aid maintenance and repair by service technicians. With proven Gigabit performance, POF can provide the physical layer for any of the broadband networking technologies that may be used to connect these devices, such as Ethernet, media oriented systems transport (MOST) or digital video port (DVP) for cameras. 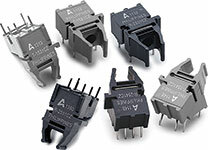 The galvanic isolation inherent in fibre connections also helps safely connect modules that operate at various different voltages, such as the electronic control units (ECUs), actuators and power circuitry within battery management systems (BMS) of hybrid/electric vehicles (HEVs/EVs). As a low-cost medium that is easy to handle, POF also offers attractive properties for a variety of sensing applications in industry and the IoT. An optical sensor can be defined as a device that uses optical fibre as the sensing element, or a sensor that communicates signals to the host system via an optical connection. Optical strain sensors and temperature sensors, which are traditionally created by inscribing a fibre Bragg grating (FBG) in the core of multimode glass fibre to change the reflectivity at specific wavelengths, can also now be created using POF. Analog transmitters and digital receivers for POF from Broadcom. Broadcom has demonstrated POF sensors that achieve accuracy comparable to that of traditional FBG sensors by using optical phase interrogation (OPI). OPI measures the phase shift induced in a light source injected into a POF sensing coil by comparing with the phase of an unstrained reference coil. POF OPI sensors have been applied successfully to monitor stresses on wind-turbine blades, taking advantage of POFs exceptional elasticity to withstand the extreme flexing of the blades. Other research has shown how POF can be used effectively as a gas-sensing element for indoor atmospheric monitoring and scientific purposes, by depositing a thin coating of reactive material on the outer surface of the fibre (such as 40 nm of silver to detect hydrogen disulfide in air, or up to 200 nm of silicon dioxide to detect fluoride ions). This changes the POFs light transmission characteristics when exposed to the monitored pollutant. On the other hand, reflective or transmissive presence detectors can be produced simply and economically using POF to conduct the sensor output signal directly back to the host system. Using POF avoids any need to integrate electronic circuitry in the sensor itself, helping to create low-cost, low-power devices that are highly optimised for IoT applications. Makers, too, are taking advantage of POFs easy-handling characteristics to create their own couplings for lighting and signalling projects. Bypassing standard couplings that are available off the shelf, individuals have shown how to adapt the package of a round plastic LED to insert POF and encase the assembly using heat-shrinkable sleeving, creating an effective, budget-priced light guide. Combining significant performance improvements with known ease of use with economy, POF is bringing the advantages of optical networking to communication and optical sensing applications that cannot be satisfied using copper cable, wireless or glass fibre. By enabling fibre to penetrate throughout an array of more cost-sensitive applications, POF is extending the reach and democratising the privileges afforded by optical technology. Flat-cell designs are getting price competitive and battery experts predict a shift towards these cell formats, especially if the same performance criteria of the cylindrical cell can be met. The fundamental technologies that will form the basis of IIoT implementations are connectivity, sensors and actuators.